A Blue and Gold Celebration happens this weekend at Brandon University. On January 11th and 12th, put on your BU colours and join us for events and prizes in the new 25-million dollar Healthy Living Centre (HLC). Activities include Bobcats basketball, facility tours, Kids Carnival and tailgate party. Giveaways include an iPad, University tuition and Bobcat rally towels. Meet radio personalty Tyler Glen from Star-FM. Be a part of raising the Bobcat championship banners in the new gymnasium. 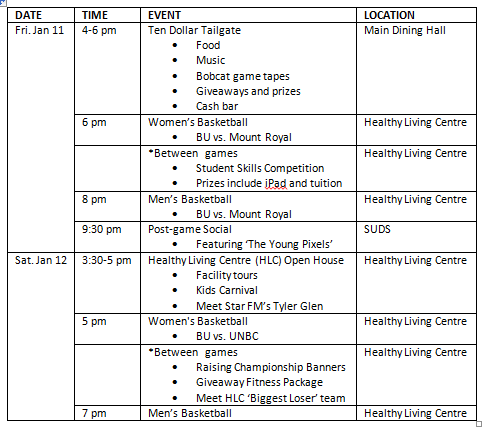 Friday kicks off at 4 pm with the ‘Ten Dollar Tailgate’ followed by exciting Women’s and Men’s Bobcat Basketball. There’s an after-game social, too, featuring The Young Pixels. 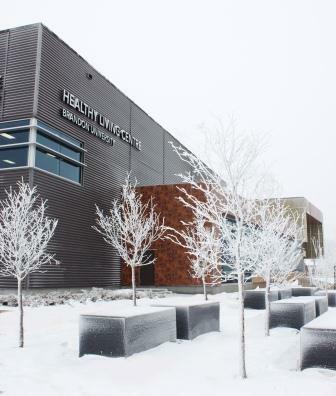 On Saturday, tour the new Healthy Living Centre between 3:30 and 5 or wear blue and gold, and receive free admission to that night’s Bobcat games.